It is a dream for many people to travel across the planes of Africa and observe the Big Five from the savannah. Watching the cheetahs run, the gazelles leap and the lion's roar can leave any person in awe of their magnificent presence. For other jungle-themed games, view online UK slots here! 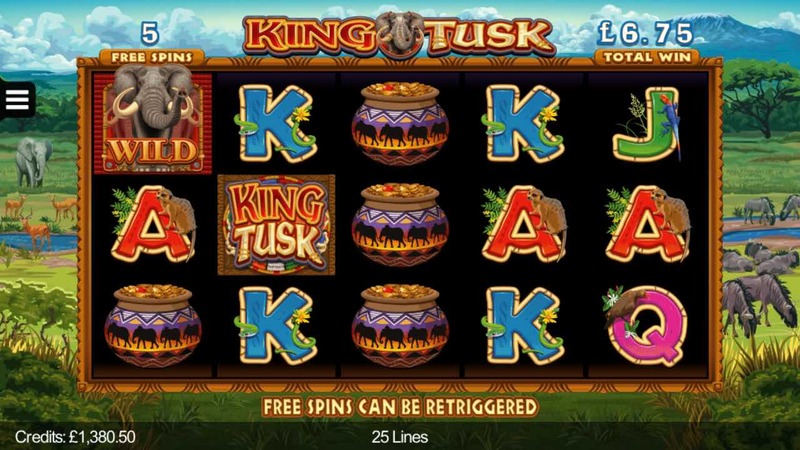 If you're someone who wishes for that dream to come true, but not a fan of being on an aeroplane for a good few hours, then you can sit back at home, turn on your device, and load up Microgaming's online slot game, King Tusk, on your screen! It is certainly a game where you can win more than what you've originally betted! Many experienced casino gamers that play in both land-based and online casinos will tell you to place your trust in any game that has been designed and developed by Microgaming. They may more or less the same age as Google, but they know how to make each and every one of their games adapted to some of the most advanced mobile devices in the tech market. The developers behind the brand also know how much their iGaming lovers enjoy delving into nostalgia every once in a while, which is why some of their most loved games like Jack In the Box and Agent Jane Blonde still keep its pre-millennial aesthetics. 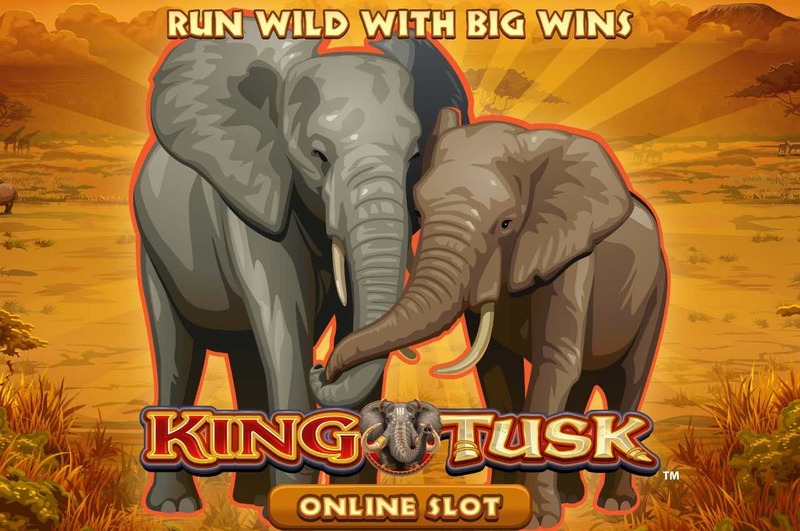 If you have also enjoyed playing some of their other games like Mega Moolah, Lotsaloot, and Major Millions, you will certainly revel in playing King Tusk! You can discover slot games online here at Wizard Slots. The game begins with a large field of long grass placed on your screen, where you will see the great mount Kilimanjaro at the far distance away from the 5x3 fixed grid. All of the buttons are laid out on the corners of the screen, so you won't have to worry about where you can see the paytable or the autospin button. We recommend you read our guide when you click here. As for the base symbols that you will need to get into a matching combination from left to right are some of the classical A, Q, J, K, 9, and 10 symbols which give you low payouts. The base symbols with the high payouts come in the form of a traditional African soup bowl, an elephant, and a herd of elephants. Seeing a herd of elephants wander across the planes can be a magical experience to have, and so is seeing some of the special symbols that will give you a couple of BONUS FEATURES. Elephant WILD: This symbol can appear anywhere on any reel, and replaces all of the symbols except for the King Tusk SCATTERS. King Tusk SCATTER: This symbol will appear on the 2nd, 3rd, and 4th reel, and getting 3 of them in a row will get you a BONUS E FEATURE that you can use in the game. Elephants Gone WILD Feature: With this feature, you get free spins, and all of the elephant symbols turn into WILDS on the reels. Elephants Stampede Feature: With this feature, you get free spins, and 2 random reels will turn WILD. • Elephant Dance Feature: With this feature, you get free spins, and each spin adds a sticky WILD that stays in place for 5 spins. If you come to think about it, there aren't a lot of online slot games that dabble into African themes, which is a bit of a shame for players that dream about venturing across the continent and seeing the big 5. But thanks to Microgaming, it is now possible to win a large sum of winnings, and imagine going through the Safari with the calm traditional bongo music playing in the background. Why don't you load up this game on your device when you're free? The great King Tusk may grant you big prizes within 10 minutes of playing the game! If you liked King Tusk you will like Seasons slots game.